Welcome to our large selection of golf cart accessories! Frugal Dougal’s Golf Cart Accessories provides quality, affordable golf cart accessories and parts for the Club Car, E-Z-GO, Yamaha, Tomberlin E-Merge, Fairplay, Columbia ParCar, Melex, Hyundai, Zone, Star Car, Bad Boy Buggy, and other golf carts owned by golfers, hunters, campers, maintenance workers, home owners, and ranchers. 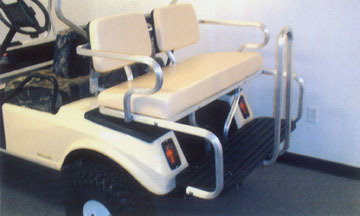 Our golf cart accesories pass the highest quality standards of manufacturing. All of our golf cart accessories are affordably priced. 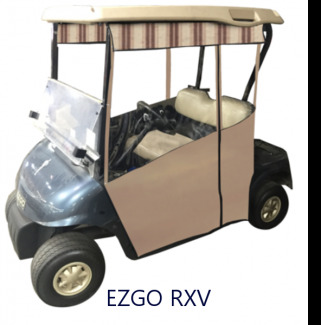 We always offer "Made in the USA" products when they are available.. We specialize in parts for older golf carts such as tops, windshields, lift kits and tire/wheel combinations, and rear seat kits for the Club Car DS 1982-2000.5, the E-Z-GO 1980-1985 and E-Z-GO 1986-1993 Marathon, and the Yamaha G1 and Yamaha G2/G9 golf carts. 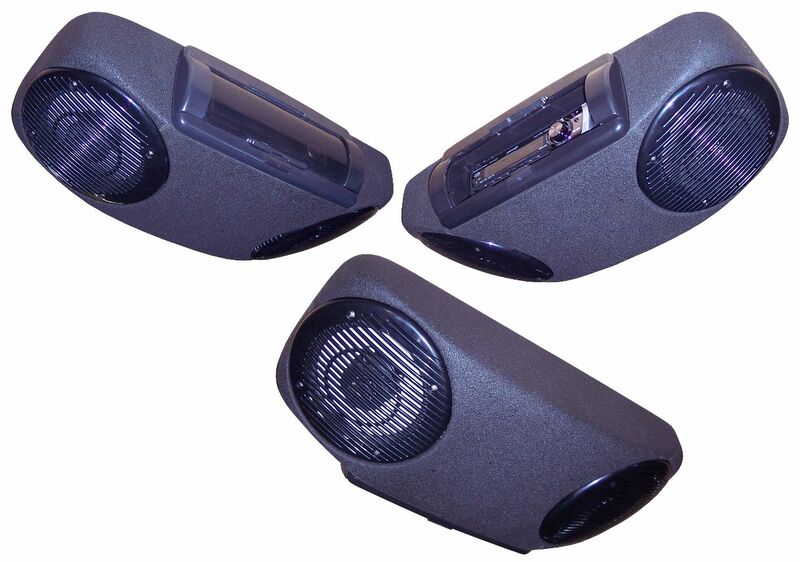 The featured produce of sale for this Spring 2019 is the Radio Stereo Complete Sound System. For the full details, check it out on our Radio Page. This is the lowest price you will find. .Featured Accessories for This Spring. For Spring, it is time to think about sprucing up your golf cart with new Decorative Vinyl Seat Covers, an Original Club Rain Protector, a colorful Rubber Floor Mat, a Convertible Top, protective Garage Floor Mats, and a Fitted Track Style Enclosure..
We have deeply discounted most of our products for the Yamaha G2 and G9 as our featured older model golf cart. Please see the G2 G9 tops at $176, fold down windshields at $90, lift kit at $294 and golf cart club rain protector at $122. 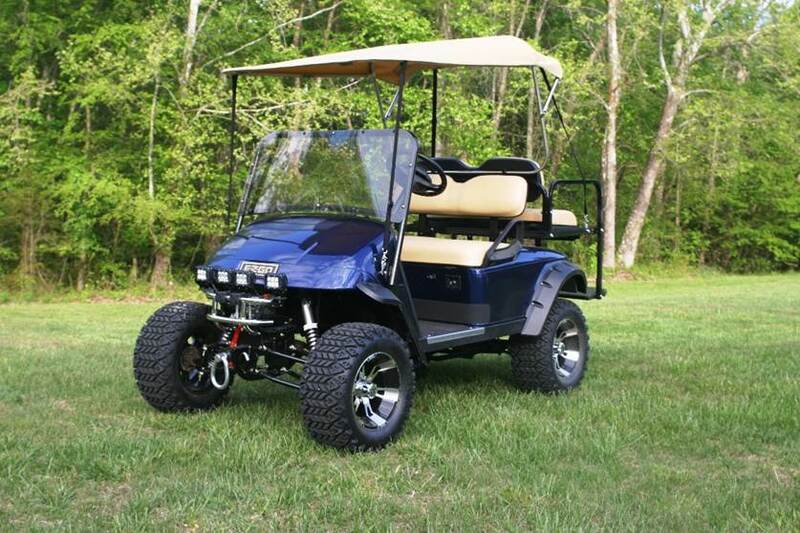 These are the best prices you will find anywhere for this older model Yamaha golf cart! Try these affordable gifts for the person with a golf cart: flag pole with a college, NBA, or NFL flag, an embroidered cooler on the front of the golf cart, the clock/compass/thermometer, or a portable fabric club and ball washer. New under the cart lights! An under the cart LED light kit flashes like a strobe, rotates, and activates to music. Change the color from 7 primary colors to any shade in between. Be bright orange for the Halloween trick or treating or alternate between red and blue for the Fourth of July parade. A great gift! 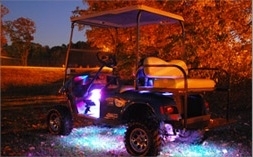 One customer said the lights are a "blast" and that his golf cart is now the "envy of the neighborhood." All hard tops, canopies, roofs are Deeply Discounted, and all come as a complete kit. Also, most accessories for the Yamaha G2 G9 are on sale. Check out the Wikipedia article on Solar Golf Carts which features a picture of Frugal Dougal's Golf Cart Accessories' Solar Roofs. NEW is a convertible soft Sunbrella top that fits on most golf carts. This cloth fold down Bimini style top is also called a rag top. It is very popular with racing teams that only have limited height in their travel trailers and for decked out carts that want a sporty look. 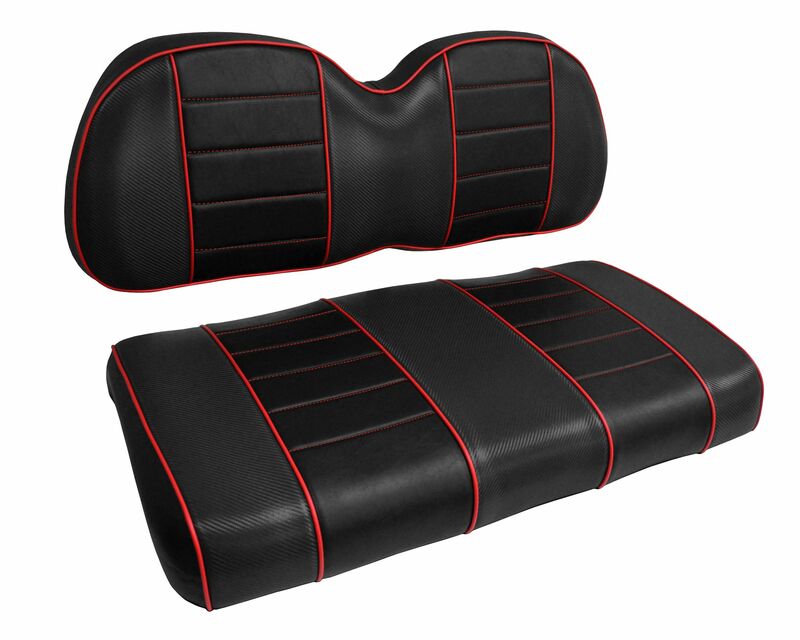 Add a sport windshield for protection and to complete the retro look. New on Frugal Dougal's Golf Cart Accessories are lift kits with a suggested set of four tire/wheels for all makes and models of the Club Car, E-Z-GO, and Yamaha golf carts. Check out the lift kits for the older Club Car DS, the E-Z-GO Marathon, and the Yamaha G1, G2/G9, and G8 golf carts. Change the look of your cart with a camo or lightning body wrap. A decoratively stitched leather steering wheel cover has been added. New is a golf cart gun rack. 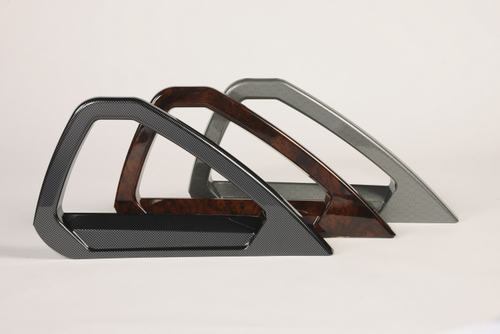 Add elegance to your golf cart with our new dashboards, glove box locking doors, and rail covers in matching burl wood, carbon fiber, or titanium finish. Below are the rail covers for the E-Z-GO TXT showing the 3 new finishes. If you would like help in identifying your golf cart model and year of manufacture, please call Customer Service at 727-487-6615 . 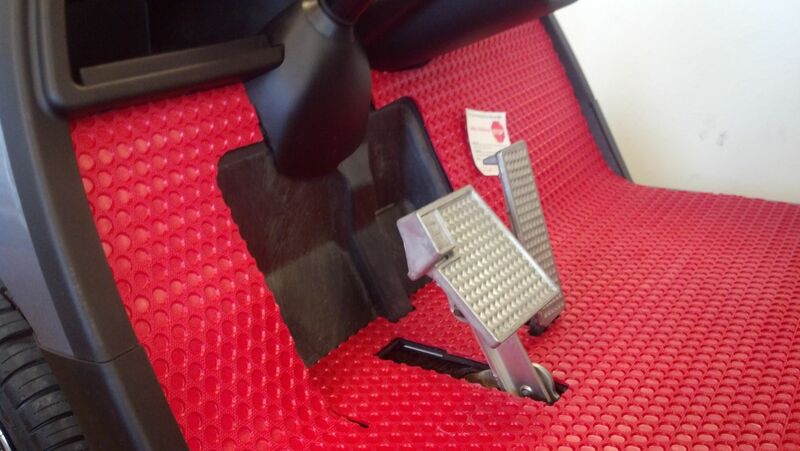 Most of our golf cart accessories are made in the USA. For a little fun, check out these decked out golf carts. We thought you might be inspired by Ida playing golf at 101 years old. It is a short video. "Thank you ...appreciate the excellent communications." Frank M., Ocala, FL. February 2019. "Thank you Peter! Your company and the customer service and communication is the best I have ever experienced! All good wishes for you and yours in 2019!" Margaret J., Belton, TX., December, 2018. "Our experience with your company has been more than exceptional. When our golf cart top would not work on our unit, Peter went above & beyond to ensure we had the correct parts to make it work. It is very enlightening to know there are still companies that truly care about customer satisfaction. Will highly recommend to other friends for golf cart equipment." David & Kathi W.,Ashville, NC, July 2017. "Thanks Peter for all the expert help you have given Judy and I with this order, we will certainly tell our golf cart friends about what you have done for us and highly recommend you to them." Ron R., Marblehead, OH. JulY, 2017. "You may use my name as a reference regarding your product and company. Not only am I pleased with the product (full size rubber floor mat in Burgundy for a Club Car Precident) I purchased but I also had a wonderful customer experience dealing with your company. You did put the customer first when you handled my order. I made a mistake on my order and you went out of your way to clarify what I wanted. Very good experience." John M., Oro Valley, AZ, April, 2017. "Just would like to extend my appreciation to you and the company. The roof and all supports work perfect. Just got done mocking it all up. Great communications with everyone and truly all around fantastic experience. Wish more companies were like you. Again thank you so very much and expect more orders from me. Thank you" Jason L., Ravena, NY, April, 2017. "IT WAS AN ABSOLUTE PLEASURE DOING BUSINESS WITH YOU AND YOUR COMPANY. YOU CAN REST ASSURED, THAT IF I NEED ANYTHING ELSE FOR MY CART, IT WILL BE FROM YOU!!! (Customer ordered a black convertible top, and it shipped the next day.) James C., Southington, CT., May, 2016. "I very much appreciate your assistance. You conducted business in a most professional ethical manner. Prior to my retirement, I was Senior Vice President for Economic Development for the three Northern Kentucky counties, Boone, Campbell and Kenton bordering Cincinnati. During my economic development career, I worked with many large corporations to locate and or expand. A common element of those successful companies were employees who possessed ethical and professional attributes. You (Peter of Customer Service) are such a person. Bob G., Burlington, KY., May, 2016. "Thank you. You guys have been great. We appreciate the customer service!!" Jason G., Manteca, CA, April, 2016. "I just wanted to let you know that we got the windshield! My dad is so very happy and it fits like a glove!! I really just wanted to say thank you for taking the time to help me figure out how to help my dad. It means so much to me that you took the time and looked at the pictures and took the measurements. You didn't have to do that, but you did. Most companies would have just said "No we don't do that". So from the bottom of my heart, I say thank you and please pass this on to the guy who custom made it also!! You both went above and beyond and my dad is so tickled!! He is a retired Navy Veteran who is now without a hip and uses his golf cart as his mode of transportation here in our small town. God Bless YOU!! Shelli K., Spencer, IN, November, 2015. "I have to say I’ve been very impressed with your help on this order. It’s not a large order and you’ve been very attentive in making sure we get exactly what we want. It’s so seldom you get true “customer service” these days. Many thanks for your help. It is greatly appreciated. " Mary Ann G., Palm Beach County, FL, September, 2015. 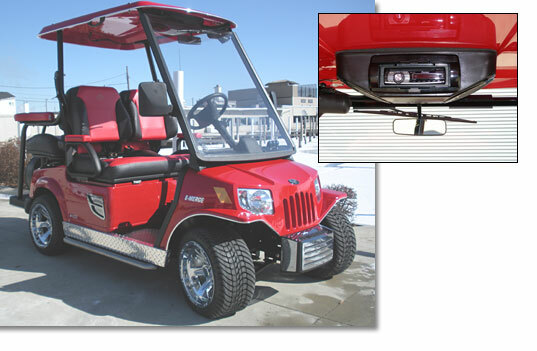 Personalize your golf cart with custom golf cart accessories. Enhance the appearance of your golf car, stay comfortable, add essential storage space, and attach golf cart accessories to the cart to improve your game. Let our friendly customer service staff answer your questions. Please click on any of the golf cart accessories to the left to get full technical descriptions, prices, and ordering information. Make your golf cart look the best in town!